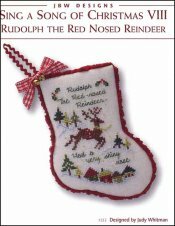 Sing A Song Of Christmas 8: Rudolph The Red Nose Reindeer [J1915] - $8.00 : Yarn Tree, Your wholesale source for cross stitch supplies. Cross stitch pattern by JBW Designs. Hey, look, it's Rudolph the red nose reindeer with a very shiny nose! Rudolph, with his jingle bells on, is leaping through the snowy hillside, decorated with evergreens. Houses are filled with family & friends as they celebrate Christmas. It doesn't get any better than listening to "Rudolph The Red Nosed Reindeer", while sitting by the fire, stitching this design. Stitch count 47W x 63H. Stitched on #2181 Zweigart Belfast Linen 32ct. Antique White.